MASCOT GONE WILD: What cougars really do. Principal Dockery poses with Cougie. Here at Asheville Middle, our mascot is the vicious cougar. Cougie appears at many of our sports events and pep rallies. In the wild however, they lead a whole different life. With the ability to leap as far as 40 feet, the cougar is no animal to mess with. Cougars are carnivores, meaning that they hunt and eat other animals. They hunt alone from morning to night, eating whatever is available in their location. Cougars, on average, will feast on a deer every two weeks (mule deer in western North America and white tailed in the east). When they aren’t lucky enough to catch a deer, they will add smaller mammals, such as mice, squirrels, rabbits, beavers, raccoons, and porcupines onto the menu. Cougars are found almost everywhere in the Western Hemisphere. One species of the cougar is the Florida panther, which, like the name states, can only be found in the state of Florida. In North America, they live in United States, Canada, and Mexico. They also live in parts of South America. Younger cougars have spots, but as they get older, they disappear. 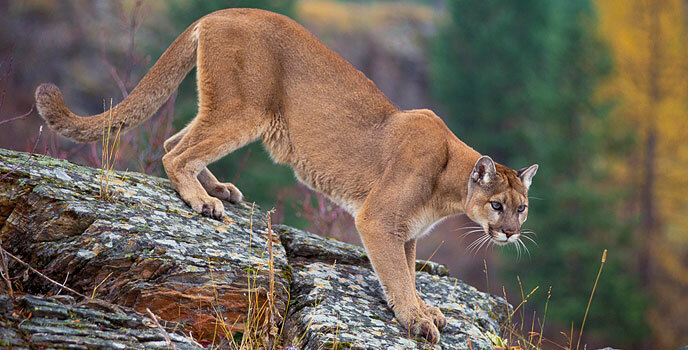 Cougars, mountain lions, and panthers are all names for the same animal. Cougars can live up to 12 years in the wild. They can jump 15 feet up a tree.